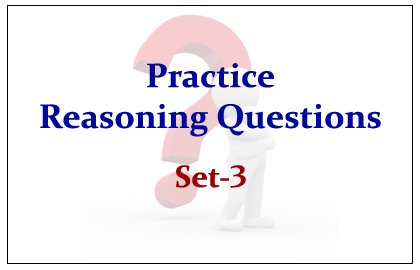 The List of Reasoning Questions that asked in previous year Bank Exams was given below. Candidates those who are preparing for the examinations can use these questions. Pole A is 12m towards east of B. Raju starts walking from pole B, he walks 6m towards west and takes a right turn. After taking the right turn he walks 8m and reaches pole C. Again he takes a right turn and walks 18m and stops at pole D.
1).In which direction is pole C with respect to pole A? 2).What is the distance between Pole A and Pole D? 3).What will come in place of question mark (?) in the following series? 4).How many such pairs of letters are there in the word FLAVOUR each of which has as many letters between them in the word as in the English alphabet? 5).In a certain code language SEARCH is written as QCDUAF. How is METHOD written in the code language? 6).In a certain code language FIGHT is written as ‘6%7#@’ and TEARS is written as ‘@5ns3’. How is STAGE written in the code language? In a certain code language ‘frog eats insects’ is written as ‘pa sa ta’, ‘insects leap very high’ is written as ‘fa za sa ka’ and ‘from leap on insects’ is written as ‘ha pa fa sa’. 7).What is the code for ‘insects’? 9).What is the code for ‘on’? 10).What is the code for ‘high’?